The era of high employment has taken a sharp downward turn. The U.S. economy was cooling rapidly even before terrorism entered the picture. Employee layoffs are now measured in the hundreds of thousands. Many of these employees were entry-level workers just starting their careers. The Labor Department's statistics on teenage and young adult employment reflect a substantial rise in unemployment rates. With unemployment rising in nearly every community, there is a compelling question before us: what are the long-term effects of unemployment spells? This is a difficult but very important question, particularly when shaping policies that may create unemployment among young workers. The effects of early unemployment can last much longer than many recognize. In fact, the effects of even relatively brief periods of unemployment can be felt (and measured) for years, not months. The range of policies that could lead to unemployment among young workers is fairly easy to identify. Many policies that increase the cost of employing entry-level workers either have a proven record of causing job loss (e.g., minimum wage hikes) or carry clear risks of undermining employment levels (e.g., mandated benefits, increased payroll taxes, etc.). Other potential culprits could include tax, expenditure and monetary policies that cause unemployment to rise. It is well known that young people have the highest unemployment rates and their labor market success is quite sensitive to the state of the overall economy. 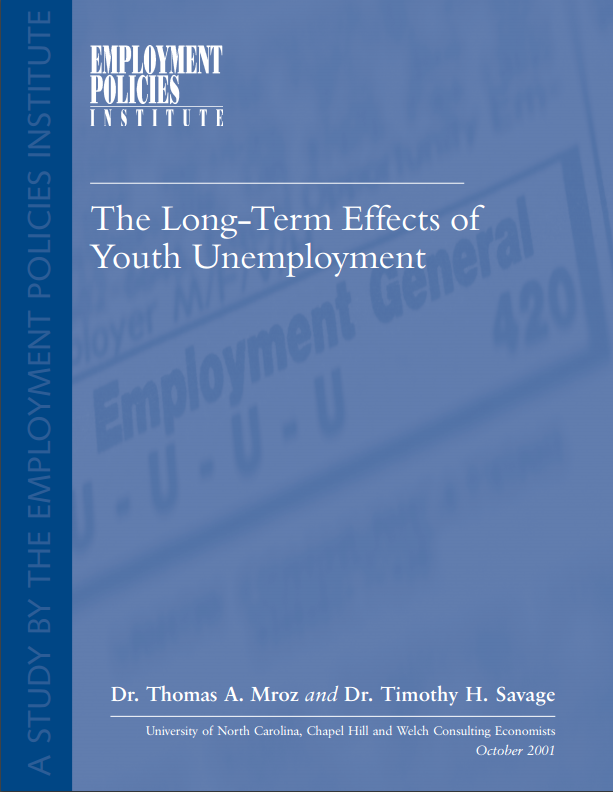 In this new research, Dr. Thomas A. Mroz of the University of North Carolina at Chapel Hill and Dr. Timothy Savage of Welch Consulting Economists show that policies causing youth unemployment can harm young adults for several years into the future. Far from being a fleeting annoyance, early unemployment has measurable, persistent effects that can be linked to the stagnation of human capital that occurs when an individual is not working, in training or in school. Using the National Longitudinal Survey of Youth (NLSY) Drs. Mroz and Savage study young men and their labor market reactions over time. The NLSY tracked the employment, education and demographic status of young men from the ages of 14 to 19 beginning in 1979 through 1993. Several factors describing the sample workforce change as the sample ages. From 1979 to 1993 the percentage of the sample experiencing any unemployment during the year decreased from 30% to 19%. Annual hours worked increased from an average of 628 in 1979 to 2,026 in 1993. Not surprisingly, average level of education and training increased over time, while the number in school decreased steadily. These statistics all show that human capital increased steadily over the sample period for the average male of that age. The core subject of the research, however, is an examination of the effects of a period of unemployment on future employment. Early unemployment delays gains in experience and training that usually lead to increased earnings. Prior work experience has been found to have a large and positive effect on future earnings, which is disrupted by an unemployment spell. A 13-week unemployment spell last year reduces wages this year by 3.4%, or about $900 (in 1993 dollars) for a full-time employee. A similar unemployment spell as long as four years ago reduces average hourly earnings by over 1%. At full-time in 1993, this amounted to over $300. A six-month unemployment spell experienced as long as four years ago reduces wages by 2.3%, equivalent to forgoing about one-quarter of a year of schooling. In addition to suffering from lower wages after experiencing an unemployment spell, many are subject to increased likelihood of future unemployment. Not only do they have higher chances of being unemployed, but also those spells are shown to be longer for those who were previously unemployed. Those previously unemployed as long ago as four years have a higher probability of being unemployed in the present year. A 13-week unemployment spell last year increases the duration of a contemporaneous unemployment spell by over 1.5 weeks annually. A term of unemployment last year decreases annual hours worked this year by approximately 5 hours annually for every week unemployed. One of the primary findings of this research shows that during the period following a spell of unemployment, young men attempt to "catch up" to where they would be had they not been involuntarily unemployed. These young men attempt to replace the human capital gap created by a spell of unemployment. Prior unemployment is shown to have a positive effect on the contemporaneous likelihood of training. This effect lasts for only a short period as young men attempt to increase their economic value. The results produced by Drs. Mroz and Savage show that policies causing youth unemployment (even unintentionally) lead to tougher roads for those youths that are most vulnerable. Those experiencing unemployment at an early age have years of lower earnings and an increased likelihood of unemployment ahead of them. Policies that may cause job loss can inadvertently lead to decreased wages, increased chances of unemployment and longer future unemployment spells for the most vulnerable.